Instead of moving clients to and from their tables while in standard chairs, we offer many mobility options. All our mobility options have in mind not only the comfort of the user of the chair but also the safety of the caregiver. For example, the Royal EZ can be installed on a dining room chair and is available on our Titan and Contessa series. If you are in a “no lift” facility 4 we also have chair options that would be available. 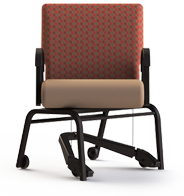 For this purpose, the Titan Swivel chair allow the user or caregiver to push a small lever to turn the chair to the table before it will lock in place. Our new Chair Caddie allows for full movement of the client with a brake that ensures that it locks. Simple changes like adding mobility assistance chairs into the current inventory can help reduce these costly incidents. Visit our website for more information on these and other products that we offer. ComforTek Church Chairs Put to the Test!